FitKids Childcare implements the Creative Curriculum approach in supporting the developmental needs of the children in our care. 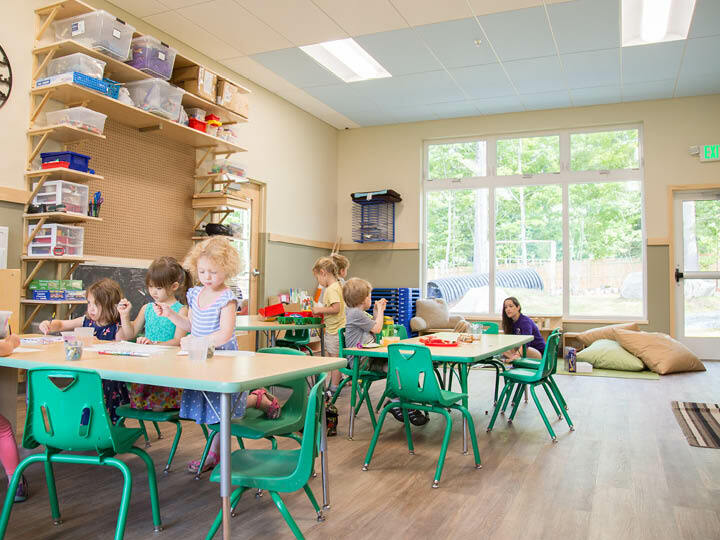 We use the Creative Curriculum as a guide when creating lesson plans, holding parent/teacher conferences, and organizing our classrooms to provide a variety of activities to meet each area of a child’s development. Social-emotional development involves the building of relationships with others, as well as the understanding of the emotions of self and others. Forming strong bonds in early childhood is especially important in the development of these skills. Mathematical development in early childhood begins as informal math concepts such as size comparison or the concept of one, two, and more. These skills help form the basis for more formal learning later in life. Cognitive development focuses on a child’s information processing skills, and their ability to think and understand. How children learn can vary, and learning can be nurtured by intentional teaching and individual modifications. Social studies concentrates on people and society. Everyday experiences allow children to learn about the people and how they live and work together. Early childhood focuses more on immediate social settings, which then grows into an interest in the larger community. Physical development includes gross motor skills such as crawling and jumping, as well as fine motor skills like the use of utensils and writing implements. Science & Technology: Scientific exploration in early childhood is about exploring the world around you. Children are able to learn how to make predictions and connections through their every day experiences. The developmental area of language encompasses a number of abilities, from comprehending the language of others to using language to express thoughts, needs and wants. Dancing, drawing, making music and pretend play are all ways for children to express themselves creatively while exploring different mediums. Literacy development encompasses both reading and writing. Early progress in these skills is related to later successes in school and life. While all children are learning language in early childhood, this focus is on those young children who are learning English in addition to their home language. Children learning English in addition to a home language may be bilingual if they are learning both languages simultaneously, or they maybe sequential language learners if learning English after their first language.